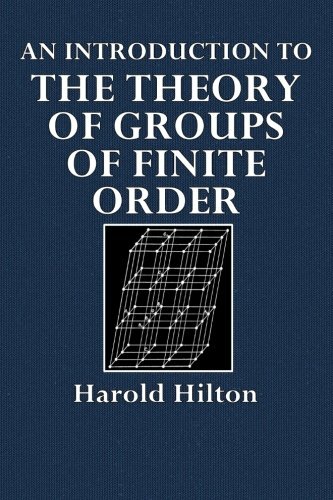 This book aims at introducing the reader to more advanced treatises and original papers on Groups of finite order. The subject requires for its study only an elementary knowledge of Algebra (especially Theory of Numbers), but the average student may nevertheless find the many excellent existing treatises rather stiff reading. I have tried to lighten for him the initial difficulties, and to show that even the most recent developments of pure Mathematics are not necessarily beyond the reach of the ordinary mathematical reader. Contents: Groups (Groups without topology, Group actions and representations); Topological groups (Compact groups, Haar measure, Fourier transforms on compact groups..); Linear Lie groups (Exponential map, Lie groups and Lie algebras); Hopf algebras. As the title suggests, the aim was not a systematic treatment of infinite groups. Instead the author tried to present some of the methods and results that are new and look promising, and that have not yet found their way into the books.